When you’re a beginner, the very act of going to the gym is enough to achieve results, but once you’ve been training for a few years and have a solid base of strength and conditioning, it gets harder to make consistent gains and improvements. Avoid overtraining by doing high-intensity sessions followed by recovery days. For example, the day after a hard workout, do 20 minutes of light aerobic exercise, followed by stretches, mobility exercises, activation drills and foam rolling — that’s it! You’ll speed your recovery, flush out your muscles, release tightness and tension and feel a heck of a lot better than before. To reach a higher level of fitness or physique goals, you’ll need more fine-tuning with your nutrition and hydration. For example, your specific needs might require more of a macronutrient (carbs, for example) than you previously thought. Or maybe you’ll require better pre-workout nutrition to power you through intense training and better post-workout nutrition to help you recover. You’ll also need a bit more sacrifice. A beer or a few cookies throughout the week is totally fine. But too much alcohol (especially in one sitting) and junk food hinders your progress and makes it tougher for you to reach your goals. You know you should get eight hours of sleep each night. But how about the actual quality of that sleep? How’s your mattress? How dark is your room? What time do you go to bed? All of those factors make a huge difference in the quality of your slumber and how restorative it is. Make sure your bedroom is cool, quiet and dark. Focusing on one specific adaptation (i.e. strength) requires a slight sacrifice on something like endurance, so it’s best to focus on one specific adaptation at a time. For example, if you’re a soccer player, focus on developing your overall aerobic capacity first since it’s the foundation for your entire sport. Then, work to maintain your aerobic fitness as you emphasize lifting heavy weights to build strength. Then, maintain your aerobic and strength while building your alactic capacity (0–10 second sprints). That way, you constantly build one fitness adaptation to support the next one. To make sure you aren’t leaving anything on the table, improve your technique and double-check that you’re using the correct muscles, you’re positioned correctly and everything is properly aligned. Get someone to record you doing a lift from all angles. If you’re serious about making improvements, consider getting a trainer or attending coaching clinics to learn from elite coaches and lifters. A simple tweak by an expert with your grip, setup or arc can quickly help you lift more weight than ever before. Anders Ericsson has written an excellent book PEAK: Secrets from the New Science of Expertise. Ericsson’s research contributed to the common recited 10,000 rule. If you’re not familiar with it, Malcolm Gladwell interpreted Ericsson’s research and suggested people need to accumulate 10,000 hours to become an expert. Ericsson instead says the missed element is something he calls “deliberate practice.” As fitness experts, this idea should resonate with you. Imagine a client who wanted to get healthy and strong, but they kept repeating the same exercises done incorrectly. If they reached 10,000 hours without hurting themselves, would they really have improved? They may even be in a worse position long term. Ericsson says, “Purposeful practice is all about putting a bunch of baby steps together to reach a longer-term goal” (p. 15). Incorporate practice into daily work life – The first step in applying deliberate practice into your business is to schedule it into your daily work life. You’ll never make progress if you don’t set aside regular time. Get out of your comfort zone – If you only practice what you’ve always practiced, you’ll never grow. That’s true when you exercise and it’s true in your business. If one of your clients only wanted to exercise their biceps, you’d firmly explain that’s not a smart way to exercise. Seek immediate feedback – A core component of deliberate practice is seeking immediate feedback. That might mean seeking out a business mentor or taking an online course where you have access to an expert for a new business tactic. Don’t keep practice something that you can’t get feedback on and don’t know if you’re doing correctly. Learn from others, particularly experts – The best way to become an expert is to learn from one. That might mean reading a book like PEAK: Secrets from the New Science of Expertise, taking a seminar, going to a conference, or seeking a new certification. Our digital world provides us hundreds of ways we can learn from experts. Build mental representations – “A mental representation is a mental structure that corresponds to an object, an idea, a collection of information, or anything else, concrete or abstract, that the brain is thinking about.” (source). Many people use this form of learning in school but stopped using it as they transitioned into the business world. It can be a tremendous tool in your deliberate practice. Focus – Deliberate practice requires your full attention, so set aside a specific amount of time and remove distractions. If you’re new to this idea, read more about the Pomodoro Technique. We’d love to talk more and provide more tangible tips on how to grow your fitness business. Enter your info below to schedule a demo with our expert team! Many people focus on building their “mirror muscles” (think: chest, shoulders, arms, and abs). But to create a well-rounded physique, you don’t want to skimp on back workouts to sculpt the other side of your body, too. Whether you’re wearing a bathing suit, a tank top, or a backless dress, a well-built back shows the world you’ve got it where it counts. Physically and aesthetically, there’s no substitute for a strong, muscular back, which is why you should include back workouts into your regularly scheduled routine. To help you get started, here are some of the best back exercises found on Beachbody On Demand. Across the rugged topography of your back are over a dozen different muscles. Some of them — like the trees minor — stabilize movement at your shoulder girdle; others — including the erector spine — extend your spine, helping to keep you upright. But the primary focus of back workouts are usually the two largest muscle groups in your back: the trapezius and latissimus dorsi muscles. This is a kite-shaped muscle which extends from the back of your neck, to your shoulder blades, and down to your mid-back. Your traps are responsible for moving your shoulder blades upwards (as in a shrugging movement) and inwards (as in a rowing movement). When they’re well developed, the traps keep your posture in check and give your mid-back depth and detail. Many people, guys especially, focus exclusively on the upper portion of this muscle — the bands of muscle that give gymnasts and football players that thick-necked look. But that can be a mistake, says Beachbody fitness expert Cody Braun. “When improperly trained, the traps can round your shoulders, which causes a postural dysfunction and a higher likelihood of injury.” Solve the problem by focusing on mid-and-lower trap exercises instead, using movements that emphasize retracting the shoulder blades. Often shortened to “lats,” this fan-shaped muscle originates at your mid and lower back and attaches to your upper arms. It pulls your arms downwards and behind your body, (as in a pull-up movement), and directly backward (as in a rowing movement). The lats are your primary “pulling” muscles, and when they’re developed, they give you that unmistakeable “V” shape when your visible from behind. The lats, Braun explains, are often underdeveloped and tight. Strengthening and stretching the muscle is key for good posture and full mobility — particularly in the shoulder joint, he says. How do you exercise your back? Most back movements are variations on rowing (pulling your own bodyweight or an object toward your torso), or chinning (pulling your bodyweight upward and over a bar or other stationary object). That’s the case with the 11 back exercises below, all culled from Beachbody On Demand’s huge selection of fitness programs. Together, they’ll work all the back muscles — large and small — to ensure complete functional and athletic back development. And the best part is that you can do them all at home! All you need is some dumbbells, a resistance band, and a pull-up bar (or a door attachment). Benefits: This move is an intense, total-body challenge. It works the traps, lats, and scapular retractors in the upper body, and the glutes, hamstrings, and quads in the lower body, all while testing your balance. Stand holding two medium-weight dumbbells at your sides. Lift your right foot slightly off the floor. Keeping your back flat and your shoulders pulled back, hinge forward extending your right leg behind you. Let your arms hang straight down. Squeeze your shoulder blades together as you bring the weights up to the outside of your ribs while keeping your elbows close to your sides. Lower the weights back down and return to the standing position. Try not to let your right foot touch the ground. Keeping your knees close together, extend your right leg forward. Bending at your hip and knee, squat as deeply as possible on your left leg. Return to standing and repeat. Do equal reps on both sides. Benefits: This move can help improve posture by challenging the upper and lower back simultaneously. • Stand upright, feet shoulder-width apart and knees slightly bent, holding two medium to heavy dumbbells in front of your body, palms facing forward. • With your shoulder blades pulled back, hinge forward at the hips until your upper body forms about a 45 degree angle to the floor. • Keeping your palms turned forward, squeeze your shoulder blades together and bend your elbows, pulling the weights up toward your ribcage. • Reverse the move and repeat. Benefits: Challenge your upper back and lats while you also work your core and shoulder stabilizers. • Assume a push-up position with your hands just outside your shoulder-width, gripping two light dumbbells. Your feet should be in line with your hands. • Lift the dumbbell in your right hand off the floor, bringing your hand to the outside of your ribs while keeping your right elbow close to your side. Resist rotation of the body. • Lower the right dumbbell to the floor and repeat with your left arm, alternating sides. Benefits: This move works multiple parts of the upper back (lats, traps, and scapular retractors) with light weights, challenging the muscle fibers responsible for endurance. • Stand holding two medium to light dumbbells at your sides, palms facing in toward your body. • Take a big step forward with your left leg, bending it to assume a deep lunge position, keeping your right leg straight. • Bend forward at your hip, attempting to lay your torso on top of your left thigh. Let your arms hang straight down to the sides of your left leg. • Bring the dumbbell in your right hand up to the outside of your ribs while keeping your elbow close to your side. • Reverse the move and repeat with your left arm, alternating sides. Benefits: This move challenges the large muscles of the upper back to move a heavy load, while the lower back stabilizes and protects the spine. • Stand upright, feet shoulder-width apart and knees slightly bent, holding an EZ bar in front of your body with a wide grip, palms facing forward. • Keeping your lower back in its natural arch and your shoulder blades pulled back, hinge forward at the hips until your upper body forms about a 45 degree angle to the floor, and the bar is near your knees. • Squeeze your shoulder blades together and bend your elbows, pulling the bar up until it contacts your lower abdomen. Benefits: This classic move is great to way to widen and shape your lats, creating that wide V-shape in your upper back. • Take an underhand grip on a pull-up bar. • Pull yourself upward until your chin clears the bar, keeping your back straight and core tight as you pull yourself up. • Lower yourself until your arms straight, and repeat. • Too tough? Use a chin-up assist band to make it easier. 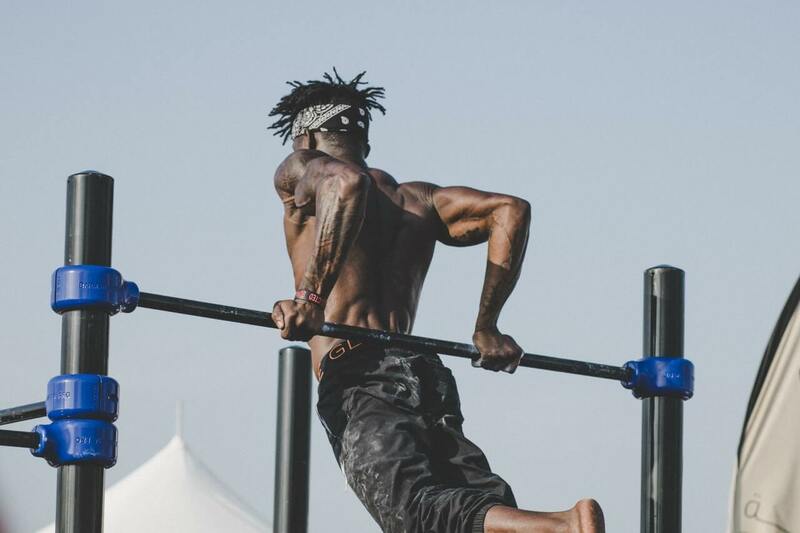 Benefits: After you’ve master the classic chin-up, try this variation to strengthen and shape your lats, while also challenging your abs and hip flexors. • Take an underhand grip on a pull-up bar with about 12 inches between your hands. • Pull yourself upward until your chin clears the bar, keeping your back straight and core tight, simultaneously pulling your knees up to the bar. • Lower your knees, straighten your arms, and repeat. Benefits: This variation of a standard pull-up widens and shapes the lats, creating a V-taper in your back, while also challenging your abs and obliques. • Take an overhand grip on a pull-up bar. • Lower yourself until your arms straight. • Keeping your left leg straight, lift your right knee as high as possible as you twist your hips to the left. • Repeat with your left leg. That’s one rep.
• Too tough? Use a pull-up assist band to make it easier. Benefits: This move widens and shapes the lats and it adds an isometric challenge for the upper back and a challenge to obliques and core. • Take an overhand on a pull-up bar. • Holding the top position of the pullup, lift your knees toward your chest as high as possible. • Keeping your knees drawn up and squeezed together, contract the obliques on your right side, as if trying to touch the outside of your right hip to your right elbow. • Repeat on your left side. • Lower your knees, straighten your arms, return to the starting position, and repeat. Benefits: This move works your lats and upper traps in conjunction with your lateral and rear deltoids. The lunge movement also fires up the muscles in your lower body. • Stand with your feet wider than shoulder-width apart, holding a medium-weight dumbbell in your right hand at shoulder height. • Pivot to the left on the balls of your feet, bend both knees into a lunge, and punch toward your left foot on the floor with your right hand. • As you return to the standing position, place your left hand on the dumbbell and forcefully drive your right elbow backward, pivoting and rotating your torso to the right. • Repeat on your left side, and do equal reps on both sides. Benefits: Using a resistance band, this move strengthens your entire back, from your waistline to the back of your neck. • Holding a light resistance band, lie on your stomach with your arms extended overhead, chest and arms lifted off the floor, and palms facing down. This is your starting position. • Keeping both arms straight, trace a half-circle with your right arm, extending it directly out to the side and down toward your right thigh. Your left arm should remain straight overhead. • Reverse the move, slowly returning to the starting position. • Repeat with your left arm, and do equal reps on both sides. How do you build a better back? To ensure that you get the most out of your back workouts, it’s essential to consider not just what you do in the gym, but what you do outside of it as well. That includes stress management, sleep, stretching, and diet. When you’re doing challenging back workouts (or any strength workouts), you need to keep an eye on your protein and calorie intake, making sure you eat enough to help your muscles grow and repair. For more information on pre- and post-workout supplements, the Beachbody Performance line is a great place to start. As the saying goes: Abs are made in the kitchen. Of course, time in the gym helps, too. 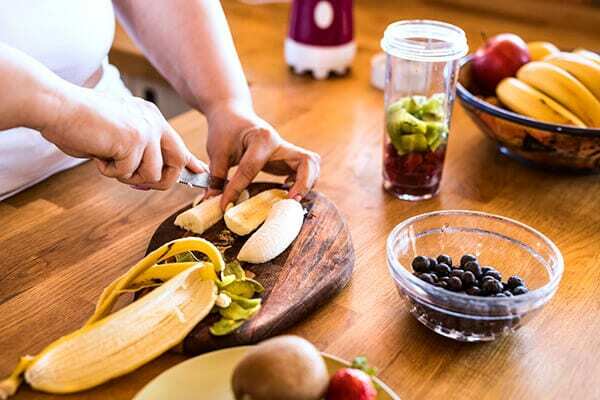 “I think nutrition for optimal performance and recovery has gained recent attention because some high-profile athletes have been public about their nutrition strategies. But the science behind this has been around for years,” says Cynthia Sass, MPH, a board-certified sports dietitian who has been a consultant to five professional teams and counsels professional athletes in her private practice. Below Becker shares her tips for eating to get the most out of your workouts, with additional expert insights from Sass. Use their advice to ensure what you’re eating is supporting your exercise. We often focus on calories, but nutrients also matter, Sass says. “Certain nutrients help your brain and muscles perform more efficiently, and others are crucial for recovering from the wear and tear exercise puts on your body,” she explains. The best macronutrients pre- and post-workout depend on the type of workout you’re doing, as well as the length and intensity. Becker recommends beets, sweet potatoes, oats, spinach and eggs for their varied benefits. “Beets increase blood flow to working muscles, which can improve your workout and boost stamina, and are rich in antioxidants, which help fight the oxidative stress that can come with intense workouts,” she says. She likes sweet potatoes for carbs, antioxidants and potassium; oats for steady energy and B vitamins, which help convert carbohydrates into energy; and spinach because a study found that it may help muscles use less oxygen, which improves muscle performance. And of course the incredible edible egg is a source of easily digestible protein to help rebuild muscles. That’s why carbs are great — they’re generally easy to digest and provide readily available, easily burned fuel. Becker recommends oatmeal with a sprinkling of hemp seeds (for protein) and sliced banana or a smoothie. READ MORE > SCIENCE INVESTIGATES: FASTING VS. CALORIE RESTRICTION? Sass recommends eating 30–60 minutes after a particularly tough workout. However, although improper recovery can make you go into your next workout weaker and increase the risk of injury, you only need to refuel within an hour after hard-core workouts. This isn’t so crucial after a walk or moderate-intensity group fitness class, particularly if you’ll be eating a meal soon after, Sass says. “Consuming the necessary nutrients after exerting your body can help replenish energy stores, build muscle, decrease soreness, burn fat and repair any damage or inflammation,” Becker says. Good advice for anyone, this is even more important for active people because “nutrients are key to performance and recovery, and unprocessed foods are naturally nutrient-rich,” Sass says. Becker and Sass agree that refined sugars have zero nutritional benefit and fried and greasy foods can be difficult to digest and cause cramping during a workout. So skip that leftover pizza before your morning indoor cycling class. Great as they are, you shouldn’t only consume these five foods. “Eat them strategically,” Sass recommends. For example, fuel up with oatmeal, sweet potato, beets or green juices pre-workout, and enjoy eggs with veggies and avocado after a morning workout.